Even though trade is important to U.S. agriculture, exchange rates are often overlooked. Currency exchange rates have been an important topic in recent years as the Dollar has trended stronger- or become more expensive – since 2012 (we’ve written about here and here). This week’s post is an updated look at exchange rates and how trends changed in 2016. In figure 1 the trade-weighted U.S. Dollar Index is shown. As mentioned earlier, the Dollar began to strengthen in 2012 and continued higher into early 2016. The Dollar’s surge was most noticeable in the fall months of 2014. The Dollar ended 2016 nearly where it began, but spent most of the year lower. After starting the year at a 12 year high (95.1 in January), the Dollar Index hovered around 90 for several months in 2016. Post-election, the Dollar again strengthened – or became more expensive- as the index reached 95.4 in December. Figure 1. Trade-Weighted U.S. Dollar Index (Major Currencies). Data Source: St. Louis Federal Reserve Database (FRED). Beyond the Dollar’s broad measure, it’s also important to consider how changes in exchange rates have varied across commodities. Commodity specific variations occur because of the differences in trade partners and volumes of trade flows for each commodity. The USDA estimates and publishes trade-weighted exchange rate indices for several commodities (table 1). Two primary observations can be made from the recent data. First, the broad strengthening of the U.S. Dollar since 2011 did not impact agriculture commodities evenly. Again, this variation is not surprising given export partners vary by commodity, but the variations are important to recognize. 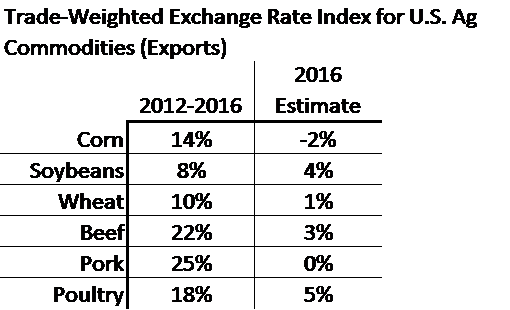 From 2012 to 2016, the exchange rate indices increased the most for meats – up 25% for pork, 22% for beef, and 18% for poultry. For grains, the increases were less; up 14% for corn, 10% for wheat, and 8% for soybeans. Second, changes in commodity trade-weighted exchange rates were fairly small in 2016. In fact, the index for pork is estimated at no change while corn is lower by 2%. Just as exchange rate impacts vary by commodity, impacts also vary across trade partners. In Figure 2, relative corn prices for the U.S. and key trade partners – Japan, Mexico, and China – is shown. The graph data are 1) USDA monthly farm-level corn prices adjusted to local currencies and 2) relative to the local currency prices in January 2014. As expected, U.S. prices trended lower since January 2014 and corn prices hit a low of 72.6 (or 72.6% of January 2014 prices) in August 2016. The latest data – November 2016 – report relative U.S. corn prices at 73.1. Changes in the relationship between the country-specific relative prices (the graphed lines) captures changes in exchange rates. With no change in exchange rates, the graphed lines would follow the U.S. relative prices exactly. Most recently – and for most of the shown data series – U.S. relative corn price has been the lowest of the four countries. For instance, the currency adjusted, relative price for corn in November was 73% in the U.S., 76% in Japan, 83% in China, and 111% in Mexico. The local-currency relative price trends are important to monitor. While U.S. commodity prices have trended lower in recent years, the strengthening Dollar has muted some of this impact. In fact, the relative, currency-adjusted price in Mexico has trended higher since 2014. The strong Dollar reduced the impact lower U.S. commodity prices might have on spurring an increase in the quantity demand of commodities. This is to say that one of economists favorite sayings – “the best cure for low prices is low prices (expected an uptick in the quantity of goods demanded at the lower prices)” – is a bit more complicated as the Dollar strengthens. Figure 2. 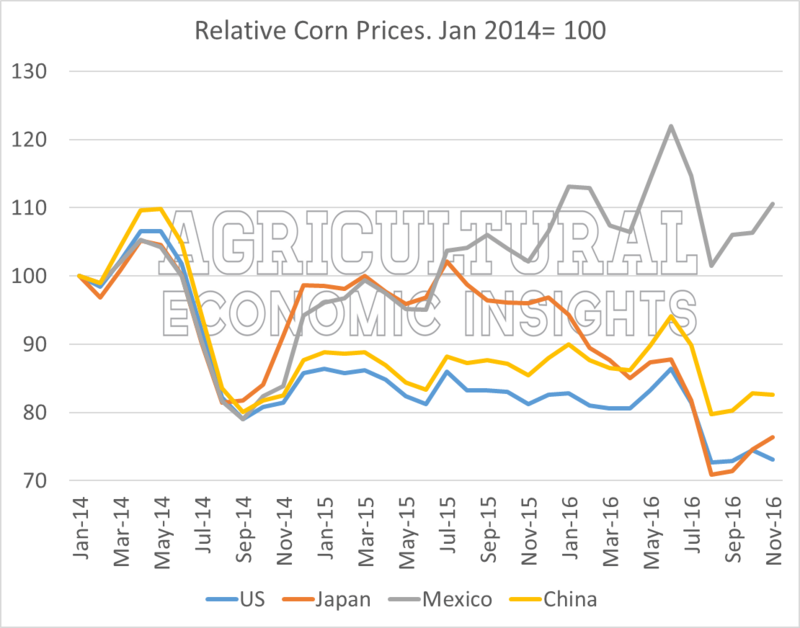 Relative Corn Prices, U.S., Japan, Mexico, China. 2010-2014. Jan. 2014 =100. In addition to the impact exchange rates have on the prices international buyers face, exchange rates and also impact the price signals international competitors receive. In figure 2, the U.S. farm-level price of soybeans is shown in U.S. dollars (blue, left axis) and the Brazilian Real equivalent price (orange, right axis). As we noted last year, as U.S. soybean prices trended lower in 2014 and 2015, Brazilian Real equivalent prices – due to a weak, low-priced Real – pushed the local-currency equivalent price of soybeans above to 2012 levels. This trend reversed in 2016 as U.S. farm-level soybean prices trended higher but the Brazilian local-price equivalent fell. From January 2016 to November 2016, the average U.S. farm price increased $0.75 per bushel, or up 9% ($8.71 in Jan. ’16 to $9.46 in Nov. ’16). However, when converted into Brazilian Reals the equivalent price actually declined 11% over the same time period. Figure 3. U.S. Average Farm Prices Received for Soybeans in US Dollars (left axis) and Brazilian Reals (right axis) – 2010 to 2015. Data Source: USDA NASS and FRED (Federal Reserve Bank of St. Louis). The Brazil Real/U.S. Dollar exchange rate is shown in Figure 4. Early in 2016, the Brazilian Real was weakest – or the cheapest – with an exchange rate of more than 4.06 Reals to 1 U.S. Dollar. The Real, relative to the Dollar, strengthened through 2016 and reached 3.35 Reals to 1 U.S. Dollar in December. While the price of U.S. soybeans trended higher in 2016, the stronger Brazilian currency resulted in fewer Reals when converting U.S. soybean prices. It’s also worth considering how recent Brazilian Real exchange rate compares to the historic relationship. While the Real strengthened to 3.35 Reals to 1 U.S Dollar during 2016, the currency is still considerable weaker than the 1.5 to 2.5 Reals per 1 U.S. Dollar the exchange rate range traded for several years. In fact, at 3.35 Reals to 1 U.S. Dollar, the Real is historically weak. Even if U.S. soybean prices stayed constant in 2017, a stronger Real would further lower the local-currency equivalent prices Brazilian farmers might face. Figure 4. Brazil/U.S. Dollar Currency Exchange Rate. Data Source: St. Louis Federal Reserve Database (FRED). Similar to soybeans and Brazil, growers in Canada noticed that an exchange rate advantage turned to a headwind in 2016. Prior to January 2013, the U.S. farm-level prices (in blue) and converted Canadian equivalent (in orange) tracked closely. 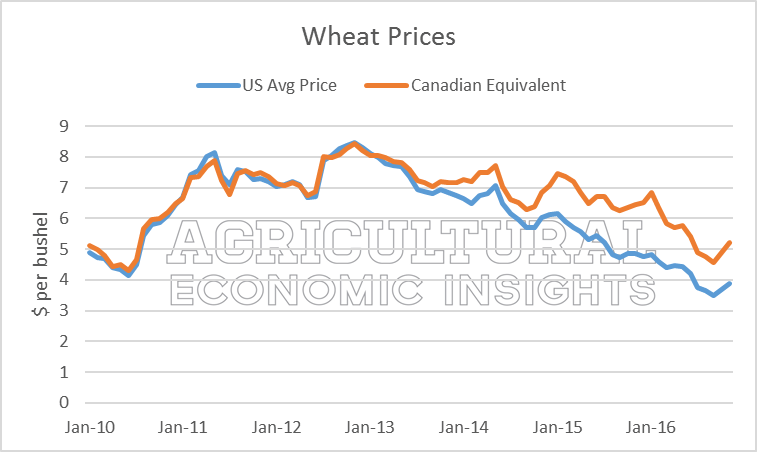 As the U.S. Dollar strengthened (figure 1) and overall wheat prices dropped, the Canadian local-currency equivalent did not drop as fast as U.S. farm-level prices. This was most noticeable when U.S. farm-level prices in late 2015 were less than $5 per bushel while the Canadian equivalent was nearly $7. In 2016, however, this gap began to narrow. U.S. farm-level prices from January through November 2016 dropped 19.5%. A stronger Canadian Dollar – relative to the U.S. Dollar – amplified the price slide as the local-equivalent wheat prices dropped 23.9% during the same period. Figure 5. U.S. Average Farm Prices Received for Wheat in US Dollar and Canadian Dollar – 2010 to 2015. Data Source: USDA NASS and FRED (Federal Reserve Bank of St. Louis). Exchange rates and the U.S. Dollar are complicated and often overlooked, but play a major role in global agriculture. When thinking about prices around the globe, what happens in U.S. markets does not also exactly translate with the prices competitors and customers face. For example, the stronger Dollar (relative to the Mexican Peso) has pushed the relative corn prices in Mexico higher in recent years as U.S. farm-level prices have trended lower. Furthermore, global competitors for wheat (Canada) and soybeans (Brazil) saw exchange rate boosts begin to erode as their currencies strengthened in 2016. After several years of trending stronger, the Dollar spent most 2016 lower and ended where it began. After 3 years of trending higher, the dollar was mostly side-ways in 2016; an overall positive story for U.S. agriculture in 2016. Looking ahead, we see the U.S. Dollar as a big unknown for production agricultural in 2017. If the broad U.S. economy grows faster than other global economies, the Dollar will likely strengthen. Or in other words, a fast-growing U.S. economy – especially relative to the rest of the world – would likely strengthened the Dollar and create a difficult hurdle for U.S. grain exports. To summarize, exchange rates and the Dollar are important to U.S. and global agriculture… and complicated.